Configuring the Spanning-Tree Protocol (STP) is mandatory in high scalable networks because we’ll have lots of switches and we'll have to build loop-free topologies. However, STP sets links in blocking state to make loop-free topologies. Therefore, some links are not used and we can’t send traffic for more than one link at a time. Maybe, you are thinking about etherchannels or LACP links to send traffic for more than one link at a time but this technology only works between two switches thus it won’t allow uplinks to more than one device at a time. An evolution of EtherChannels is Cisco Nexus vPC, which allows uplinks to two different switches to be active at the same time, but this technology is great for a server and not for scalable networks because it only allows two upstream switches per vPC. Therefore, if STP, EtherChannels or vPC is not great for high scalable networks, what technology fits this requirement? Cisco Nexus FabricPath is one of the best protocol for topologies where there are many switches with north-south and east-west traffic. Cisco Nexus FabricPath is a proprietary protocol which has enhanced the TRILL (Transparent Interconnection of Lots of Links) standard. 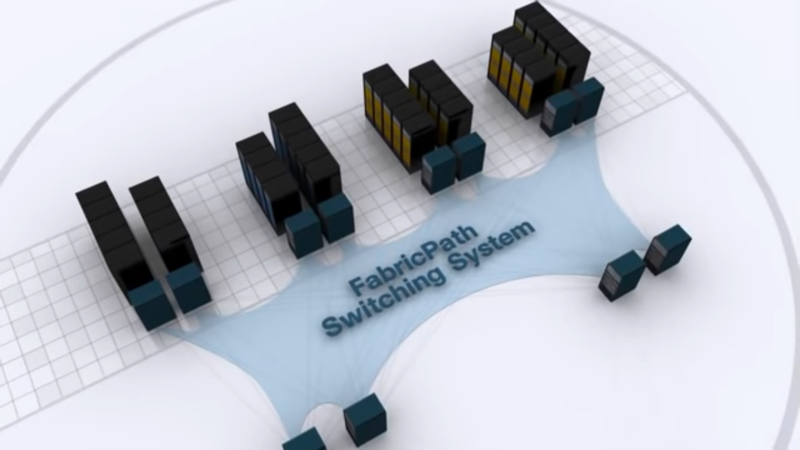 The aim of Cisco FabricPath is to replace STP to overcome the STP limitations. Hence, the Cisco protocol is going to simplify the topology and the configuration as well as maximizes bandwidth availability using ECMP (Equal Cost Multi-Pathing). In addition, as STP is not required, each switch is going to have its own Layer 2 topology which offers ECMP and loop prevention by using TTL. We are used to configuring dynamic routing protocols, such as OSPF or BGP, for Layer 3 topologies but it’s amazing how these protocols can also help us to build Layer 2 topologies with loop-free connectivity like IS-IS does with Cisco FabricPath. It’s easy to understand, as dynamic routing protocols use IP addresses to build the routing table for Layer 3 topologies, dynamic routing protocols can also use MAC addresses to build loop-free Layer 2 topologies with load-balancing traffic using ECMP. Most network engineers already know how to configure STP and Cisco FabricPath seems challenging because of IS-IS configuration. However, we don’t have to configure IS-IS because it’s automatically configured when Cisco FabricPath is enabled. This is an advantage but I have to say there is a disadvantage because STP only works at control plane but FabricPath works at control and data plane thus there is a new FabricPath header. Actually, Cisco FabricPath uses a MAC-in-MAC encapsulation where the Inside MAC (iMAC) is the Classical Ethernet MAC address and OMAC is the Outside MAC address for the FabricPath domain. What’s more, as FabricPath frame is larger than the Classical Ethernet frame, due to the extra header, FabricPath switches should use jumbo frames or have the MTU increased. Did you know TRILL or Cisco FabricPath for scalable networks?